Have you heard of Micro-investing? Essentially, it simply means investing very little amounts at a time into whichever feasible vehicles you desire. Looking back at when eToro launched in 2006 in Tel Aviv by Yoni Assia and Ronen Assia who are brothers together with David Ring, you can grasp an idea of what micro-investing really boils down to. A similar story unfolds with Acorns. When Acorns first launched in early 2016, in Australia alone it signed up close to 50,000 local users. This had quite a significance as it surpassed its the growth rate of its launch in the US. What makes Acorns an interesting app is that it links both your bank accounts and credit cards into a single platform. Once done, it identifies patterns of “spare change” and automatically invests little by little into preferred investment schemes on your behalf. Traditionally, when dealing with brokerage firms or getting access to markets, there are quite a lot of fees to take into consideration. Some may be extremely expensive, whereas others are more considerate but pricey nonetheless. Acorns offers an alternative to traditional brokerage services by reducing these fees into fixed amounts based on the capital invested. To elaborate, it would basically cost $15 a year if you’re investing less than $5,000. If you end up exceeding the $5,000 limit, you’re looking at an affordable 0.275% of the cumulative investments. According to Advisor HQ, in order to get prices as low as 0.5%, you’ll need to invest at least $3,000,000, when it comes to traditional investment brokerage services. The app itself configures your finances based on a series of personalized questions when initially signing up. This gives clients a more custom tailored experience and optimizes their preferences when it comes to investing. Commitment-wise, you’re looking at $1 as the default amount to be invested. They have an option called the roundup. It basically sums up an amount based on your daily expenses. For instance, say you spent $3.50 on a bottle of milk, the app automatically stacks away 50 cents ($0.50). 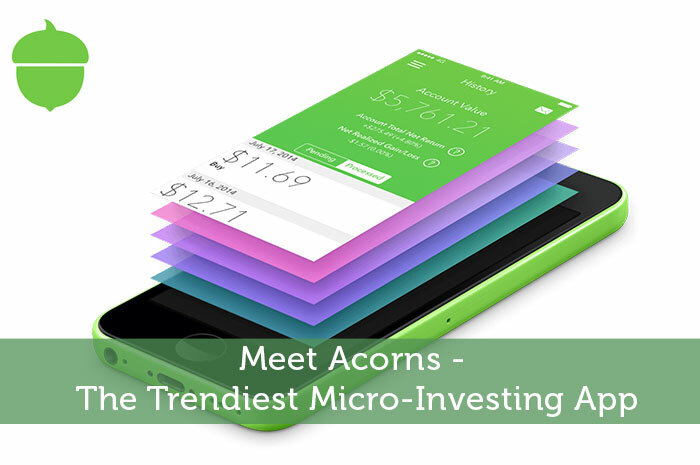 When these micro amounts reach a certain threshold, say $5, it is then deposited into your Acorns account. Customers also have the option to accelerate their deposits if they choose. This, in turn, gives them more to invest with short and long-term depending on which types of portfolios you’ve invested in. Looking at the above-referenced portfolios, you can see that there is a moderate selection for you to start with. The big question is, who is this app right for? While many may agree that the app mostly tailors to young individuals who wish to invest very little at a time, you should consider the aspect of it as an exploratory phase to get into the markets. Young investors to old, this app definitely provides a long-term benefit and gives a taste of the markets on a microscopic level. While costs are generally low, the upside is that funds are automatically allocated from your personal budget which makes it an affordable option when it comes to investing. Would you consider downloading this App and giving it a try?